Are you Planning a day trip to Ephesus from Istanbul ? 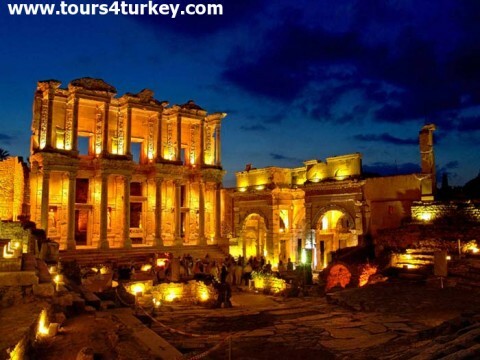 Then our Ephesus Day Trip From Istanbul is the right choice for you! Our day trip to Ephesus starts with a pick up service in Izmir airport. Transfer from Izmir airport to Ephesus for daily guided Ephesus Tour. A visit to Efes (the Turkish name of the city Ephesus) once the commercial center of the ancient world, is a highlight of any visit to Turkey scheduled any time. The city, whose wealth and patronage supported her splendid architectural program, was dedicated to the goddess Artemis. Her enormous temple, once considered one of the Seven wonders of the Ancient world and rebuilt several times, in its latest form of Ephesus dates from the third century BC. The ruins of Ephesus also include a theater, gymnasium, Agora and baths, as well as the library of Celsus. NOTE: The Ephesus International Festival of Culture and Tourism is held annually in May. Tradition has it that, after the death of Christ, St. John brought Virgin Mary to Ephesus about 40 A.D. where she is said to have spent her last days in a small house built for her on Mt. Koressos. After the guided Ephesus Tour, the agents from Tours4Turkey travel will arrange your transfer from Ephesus to Izmir Airport. Thank you very much for booking your day trip to Ephesus Day Trip from Izmir with Tours4Turkey. Please inform us if you want to add your domestic flight to Izmir into the package. What is included in the Ephesus tour?